OMG Kenny is going to make me cry! Wow, this is the fastest I've ever posted the results of an episode. Andrew/Dan get in their taxi. Ken/Tina can't get a decent taxi driver. Finally they take off ... racing Andrew/Dan through the night traffic. Phil: Andrew/Dan, you are team #5. Both: WHOA! I don't believe it! How is it possible!? 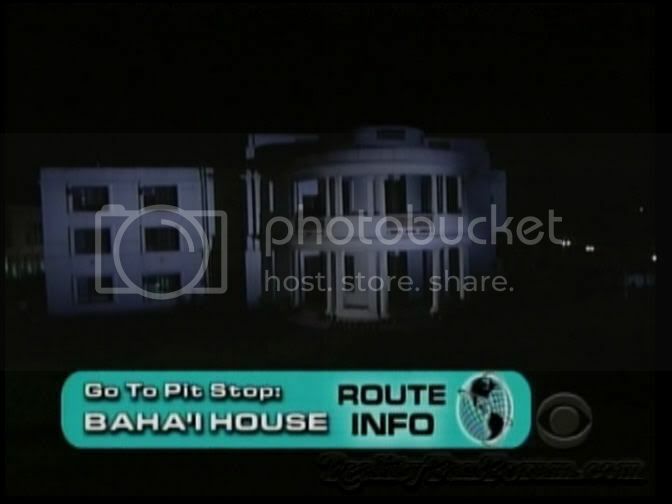 Phil: Ken/Tina, you're the last team to arrive. Good news is, this is a non-elimination leg, and you're still in the Race. Sometime in the next leg, a Speed Bump, a task only your team must complete. You may fall behind. You'll have to fight harder. Ken conf: If we don't finish ahead of at least 1 team, we'll be eliminated. Ken conf: If it wasn't for each other, we wouldn't put each other through this hell. Tina conf: It takes getting to the bottom sometimes, to get to the top. 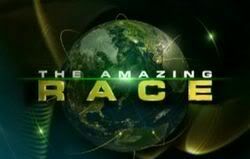 Next week on the Amazing Race. An Indian festival has Tina seeing red when she's painted green. And Kelly is pushed to the breaking point. Locals throw colored paint on Racers in an apparent Roadblock. Phil: ... and Kelly gets pushed to her breaking point. Kelly runs, gets tossed with paint, and falls hard to the ground. Kelly: No! I can't do it! Well, I think we can safely cross both Ken & Tina and Kelly & Christy off as potential victims of a Philimination. They were shown in the previews. We can also cross off Toni & Dallas because they were seen in Kazakhstan. That leaves us with Andrew & Dan, Nick & Starr and Terence & Sarah. Nick & Starr are unlikely. Their feud with Kelly & Christy hasn't come to a climax yet. So that leaves us with Andrew & Dan and Terence & Sarah. And of those two, I'm going with Andrew & Dan as the next team to hear the bad news from Phil that they're out of the Race. Nick and Starr are in Moscow, the final leg in Moscow, and are team #1 at the pitstop. OMG , gotta love Phil!! Thanks for the transcripts and the screencaps guys!! I don't get to see it until someone youtubes it. So glad to hear Ken and Tina are still in the race... there's definitely other teams I would rather seem to go before them! I never thought they'd be going home anyway. Thanks for the tip, Puddin! So with Nick & Starr making the finals, Toni & Dallas getting as far as Kazakhstan, and both Kelly & Christy and Ken & Tina featured in the previews, that leaves us with Andrew & Dan and Terence & Sarah. And of those two, I think Terence & Sarah have been better overall than Andrew & Dan. So Andrew & Dan, I predict that you'll be the last team to arrive and you'll be Philiminated from the Race!